First, we’ll create some text to bullet-ify. 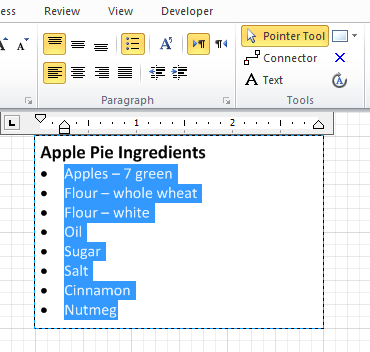 You can use the Rectangle tool to create a rectangle, then type, say, a title and a list of ingredients. Using the Home ribbon tab in Visio 2010, it’s easy enough to left-align and top-align the text. You’ll find those buttons in the Paragraph group, and they look just like Word’s and Excel’s. 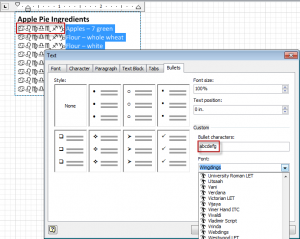 We can format parts of the text by double-clicking the rectangle, selecting runs of text, then clicking more buttons in the Font or Paragraph groups. You can see above that I’ve made the top line bold, and given it a larger font size, so it makes a nice title. 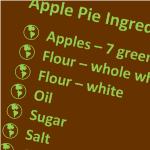 I’ve also selected the list of ingredients and give them standard bullets by clicking the Bullets button, also in the Paragraph group. 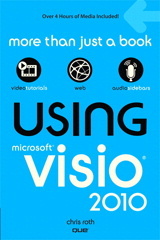 Visio has a limited set of built-in, custom bullets. 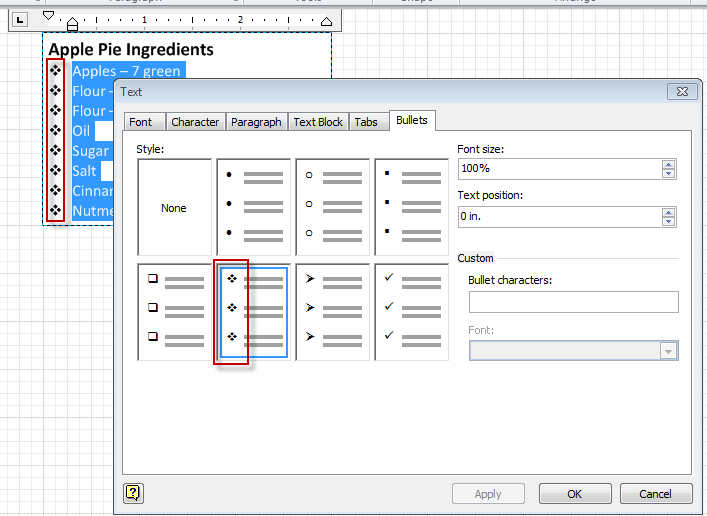 In all versions of Visio, you can get to them via the Text dialog, which has a Bullets tab. In any version of Visio, you can also just right-click a shape and choose Format > Text. If you are already in text-edit mode, then right-clicking will bring up a bunch of text-editing options. Paragraph… or Font… will get you to the Text dialog. 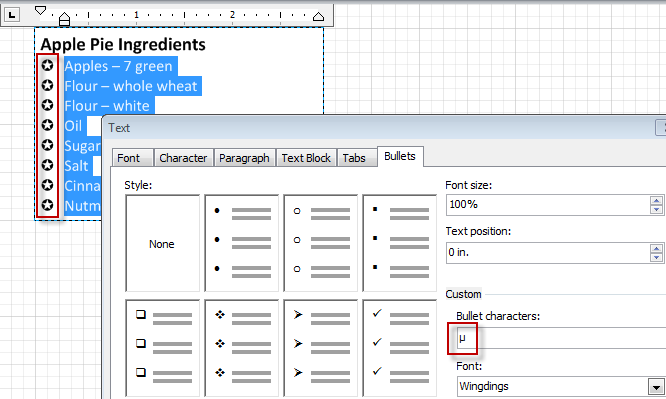 You can create custom bullets from any string of text characters, and even use other fonts, like Wingdings 1, 2 or 3, or Webdings. This opens up a whole new set of possibilities. Herein lies some of the confusion that my customer experienced. Notice when change the font, the “abcdefg” doesn’t change. It still says “abcdefg”. But when you click Apply, the bullets on the shape update with the Windings characters, as we’ve seen with the run of funny astrology characters. The customer was confused by the font not changing, and overthought the problem. He found the character codes for the bullet characters he wanted, and tried typing them in. So he was entering codes like “0xA8” into the Bullet characters field, and it wasn’t working. This seems a very logical thing to do if you’re a developer or a techie. So how do you know what “normal” character to type, in order to get an “abnormal” Wingdings character? Well one way is to use Character Map. Just go to your Windows Start menu and type “char”. Character Map should show up in the list of choices. Start that application. Select a font from the list at the top, then browse until you find a symbol or character that you like. Double-click the item to add it to the Characters to copy list. 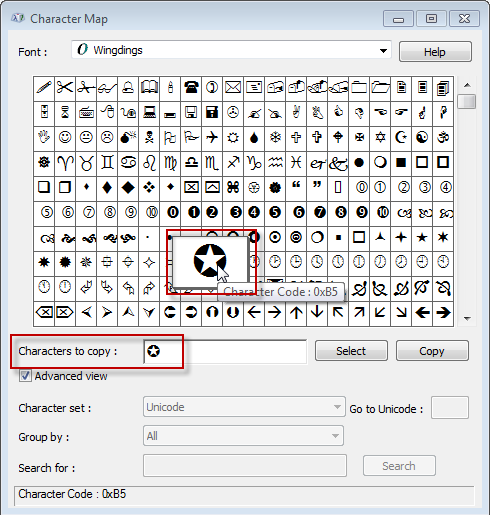 You can add several characters if you want, because Visio supports “compound bullets” or “multi-character” bullets, as we saw before with the astrology symbols. Remember that you won’t see the actual bullets on the Visio side. The field doesn’t change font to show you what the bullet will actually look like. Above, we can see that my white-on-black, star-in-circle symbol occupies the Greek “mu” character’s slot in a “normal” font. But when we click Apply, we can see that everything looks great in the shape’s text. Yes, it’s a bit convoluted and not very WYSIWYG, but it works, and it’s not so difficult once you know how to do it! If Character Map frightens you (and who isn’t frightened by Character Map? ), there are other ways to pick out bullets. 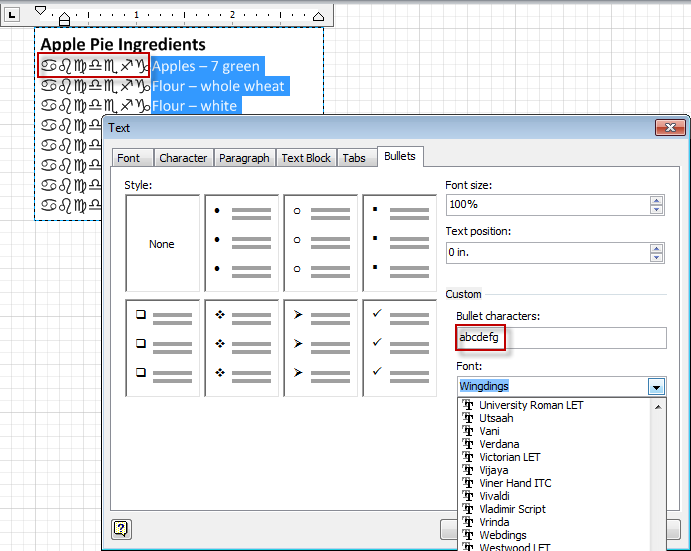 One way is to work within Visio itself by changing the font of some shape text, then copying characters from the shape. Type a bunch of characters on a scratch shape in Visio. Below I’ve just typed all the characters in upper and lower case on a U.S. English keyboard. Copy the shape, then change the font. 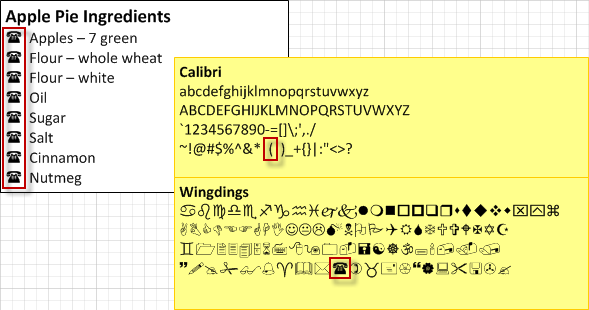 Below, the lower, yellow shape is the same as the upper, but the font has been changed to Wingdings. Find a symbol you like, copy it, then paste it into the Font > Bullets > Custom > Bullet characters field. This method won’t get you the full spectrum of possibilities that a symbol font might have to offer. Recall that our star-in-circle came from the character mu. Well, I don’t know how to type mu on my keyboard, do you? So we would have missed out on that symbol using this “type and change font” method. But it’s pretty quick, at least! You will see a pop-up window that is remarkably similar to that of Character Map. You can change fonts, and see the entire set of characters or symbols for that font. The main difference is that when you double-click an item, it is inserted directly into your Visio shape, and the font is changed to match. When you close the dialog, you can then select the character that you want to use as your custom bullet, and paste it into the Bullet dialog, as we’ve done before! So that’s how to create all sorts of custom bullets in Visio. Hopefully this tip has helped you learn a thing or two. If something’s not clear, be sure to ask a question in the comments below, or visit our forum! I am struggling with Windings etc font while parsing SVG file. 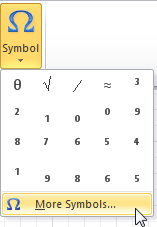 Why don’t visio use standard Unicode char of bullets instead of wingdings, weddings etc. What is your thought? another issue I am facing is that with Visio Professional 2016 when I open SVG file in notepad++, the char which has been used to make bullet is visible as just a square box which is quite strange as all these square boxes are making different bullets. Don’t know how can I get the actual char instead of a square box? Is it also possible to change the colour of the bullets? In Word (specifically) the bullets can be customised per line, does Visio do this too? I can’t make it go, if it does. I want to use the bullets as a RAG status indicator (red, amber, green) but I’m guessing I’ll have to just use an inserted image?